For some odd reason I’ve never been fond of the word dream. To me, occasionally pragmatic to a fault, dream is tantamount to a bubble or a fantasy—something not basically real, and only attainable by luck or chance. I know the word dream is idiomatically American to grasping one’s ultimate fame, or realizing extravagant materialistic gains. Nevertheless, whenever I discuss the brightness of my future, I prefer using words that are more concrete and practical sounding such as achievements, aspirations, goals and visions. In fact, whenever I’m working my book signing events in reader-lucrative Southern California, people will often comment about how I’m living out my dream. I swiftly and politely correct them: “No, it’s not a dream I’m living. I’m simply doing a job that I work hard at, and love most.” They usually respond with a silent nod and a surprised smile. Perhaps by now you may have branded me arrogant or smug. I’m really not either. Oh, indeed, I accept my moderate literary success with a confident stride. But I believe my accomplishments result from years of diligent and tedious effort—nurturing and honing my craft while pursuing my lifelong ambition. Therefore, regardless of ongoing triumphs or disappointments, at no time do I allow feelings of dreams or fantasies to clutter up my rigid earthly plan. That was, however, until I crawled through the cabin door of the small two-seater airplane, climbed down off the wing and set foot within the most spectacular backdrop of natural scenery I’ve ever physically observed—Haines, Alaska. I had been brought here to work. Yet as I stood transfixed on the slender snow-packed tarmac during that awe-inspiring moment, I felt for the first time that I was actually beginning to live out a dream. Modestly nestled within the vast glacier-peppered wilderness about eighty miles North of Juneau, “Haines” even has a name that implies humbleness. But, oh my, the biggest and grandest of America’s cities should sport the class, posture and beauty that unpretentiously envelops this rugged mountainside city. I also promptly learned that this majestic setting was complemented with the friendliness and graceful hospitality of the folks that make up the community. 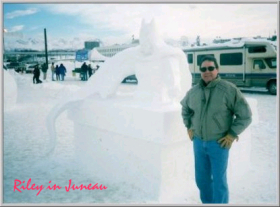 Even the long-time residents who had settled here from outside Alaska, bringing their own individualism and personalities, appeared to have blended comfortably within the true Alaskan heritage that this land steadfastly stands for. And fortunately for me, it soon became apparent that most all Haines residents love to read—children and adults alike—native or otherwise. I spent three incredible days visiting various classes in the middle and high schools of Haines, speaking about the creative writing process and my authoring efforts in general. I was delighted when interviewed for a local radio broadcast; and pleased over benefiting from a piece in the area’s newspaper. One evening, I relished participating in an impromptu writing workshop with some of Haines’ adult writers. And I particularly enjoyed speaking with a class of fifth graders, which was unexpectedly added to my schedule when I arrived. It was fun adjusting my mode of delivery to accommodate children with inquisitive eyes much wider and broader than their writing experiences. 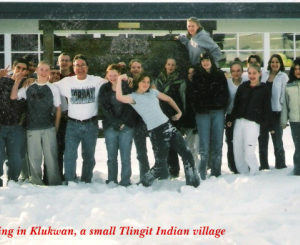 Yet my most emotional venture was visiting Klukwan, a small Tlingit Indian village northwest of Haines. The purpose of my trip was to speak at their small rural school. On route—while traveling through magnificent, jaw-dropping Bald Eagle country—I was casually advised not to be offended if the students didn’t wholeheartedly respond to me; and to just go along with the flow. Of course, I was thrilled when this proved not to be the case. I honestly believe they were the most responsive group I spoke with during my entire stay. At end, you can only imagine how fulfilled I felt when their teacher enthusiastically remarked that this type of program must happen again—only expanded into daylong creative writing workshops. She added that she hadn’t realized how much the kids needed this style of motivation until she saw them eagerly reacting during our discussions. And you can also only imagine the pride that was etched in my moist eyes as they all happily posed with me while we snapped photos. Upon leaving, I was nearly speechless—a feat not easily attained. 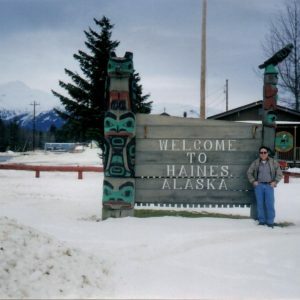 My hosts in Haines were always courteously attentive, and quite interesting. Published on “Living in rural Alaska,” Heather Lende, her husband Chip, and their five children kept me totally at ease and comfortable during the limited time I was able to spend with them. It’s difficult to aptly describe the enriching experience I enjoyed while periodically conversing with the entire family in the warmth of their home.